As we mourn the passing of a legend and dear friend, Rafe Mair’s own word’s in 2011 at his 80th Birthday Roast serve as a fitting goodbye from a man who was ahead of his time and never stopped fighting for the people and environment he loved so dearly. In the coming days and weeks, we will share more video and recollections of Rafe. Rafe was a fierce, uncompromising spirit with a deep sense of justice and unlimited reservoir of courage for speaking truth to power. He leaves behind a prolific legacy of accomplishments in government, journalism, and environmental advocacy. He was a British Columbian through and through. He loved this place – its mountains, rivers, wild salmon, and independent spirit – and gave every ounce of his soul to defending it. 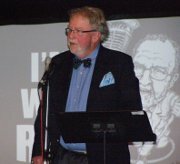 He will be deeply missed by The Common Sense Canadian and its co-founder and publisher, Damien Gillis, as he will by so many people whom he informed, entertained and inspired over a long, rich life. Thank you, Rafe, and may you rest in peace.